Our sister publication, the Journal of Chemical Education (JCE) publishes activities suitable for use in the classroom. JCE Classroom Activities, formerly a regular feature in JCE, presented activities suited for the classroom as two pages—one page for the student doing the activity, one page for the teacher whose classroom is performing the activity. JCE continues to publish many activities suitable for classroom use and no longer constrained by the two-page presentation format. This compilation includes all the JCE Classroom Activities plus similar JCE articles that have been published more recently. ChemEd X is interested in updating the Classroom Activities and/or adding additional resources to support teachers that use them. Tom Kuntzleman created a video of Classroom Activity #92: Testing for Iodine in Table Salt and added some useful tips. You might have a modified worksheet or an assessment to share. If you have resources that align with a JCE Classroom Activity or have an update, please share by commenting on the specific activity or by contributing a revision. You can also reach us through our contact form. The authors of the recent Journal of Chemical Education article, PolymerDay: Outreach Experiments for High School Students, offer a collection of interactive polymer activities designed to be part of an all-day outreach event for high school students. For teachers that might use the activities on separate occasions and/or as part of their curriculum, the authors recommend an accessible resource to support that work. This is an ACS Authors' Choice article and is open access to all. Popcorn: What's in the Bag? In this Activity, students investigate microwave popcorn, the process of microwave-promoted popping, and the materials involved: water, vegetable oils, starch, and special packaging materials. This Activity supports discussion of thermal and electromagnetic energy, phase changes, intermolecular forces, patterns of solubility, and the structure of fats, oils and starches. In this Activity, students investigate physical changes that occur in a candle to learn how a candle functions and how you can blow it out. This Activity is based on a series of lectures presented by Michael Faraday in the 1850s. In this Activity, students make funnels using plastic beverage bottles and rubber stoppers with differing numbers of holes or sizes of holes. They then determine the rate of flow of water through the funnels and identify factors that affect the rate of flow. This Activity uses easy-to-observe phenomena that model a chemical reaction with an identifiable rate-controlling step. In this Activity, students first prepare a gel using the superabsorbent polymer sodium polyacrylate (found in certain diapers) and water. The gel is split into piles and samples of different compounds are sprinkled on the piles. Students determine that ionic compounds break down the gel, while covalent compounds have no effect on the gel. In this Activity, students develop fingerprints using the cyanoacrylate fuming method on different types of surfaces. They investigate the technique’s effectiveness and test the effects of changing the temperature and humidity of the fuming chamber. In this Activity, students predict whether a given bowling ball will float or sink in tap water. Students design a procedure to collect radius and weight measurements to calculate the density of their ball. They then test their prediction by placing the ball in a large container of water, which yields the surprising observation that some bowling balls do float. In this Activity, students use their deductive reasoning skills as they identify formulas of unknown elements and compounds modeled by paperclips. Each color of paperclip represents a different element, with linkages between different paperclips in appropriate ratios representing 20 unknowns. In this Activity, students extract a fluorescent substance from shavings of narra wood. The pH-dependent fluorescence can be turned on and off using household acid and base solutions. A yellow filter blocks the exciting light but not the fluorescent emission. This Activity gets students thinking about the interaction of light and molecules. 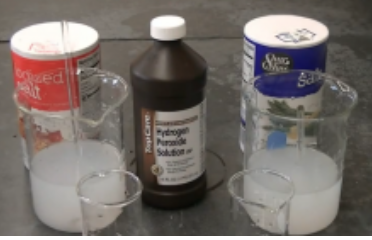 In this Activity, students determine the density of different sugar solutions (0-50%). They then dye the solutions and devise a method to combine the solutions to make a multi-colored, layered heterogeneous mixture. This Activity could be used in units dealing with measurement or density.